Wernekink commissure syndrome was first reported by Lhermitte in 1958. Ony a few cases have been reported since 1958. 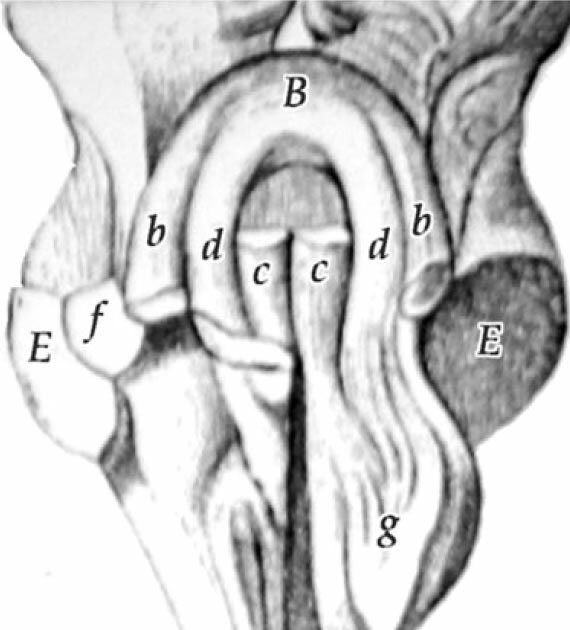 The Wernekinck commissure, actually the commisure of the superior cerebellar peduncle, is located in the caudal midbrain and rostral pons. The use of the name "Wernekinck" is somewhat colorful -- perhaps suitable for Neurology trivia bowls. The more common term is the decussation of the branchium conjunctivum (which is the superior cerebellar peduncle). The commisure is a "horseshoe" shaped structure -- on the diagram below, marked by the letter 'a'. 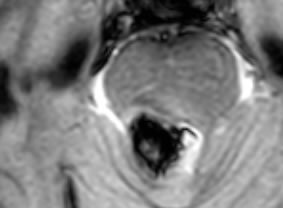 The horseshoe is oriented vertically so axial MRI sections cannot possibly visualize the entire commisure. The location of the commisure also seems a bit variable on anatomic diagrams, possibly for the same reason. 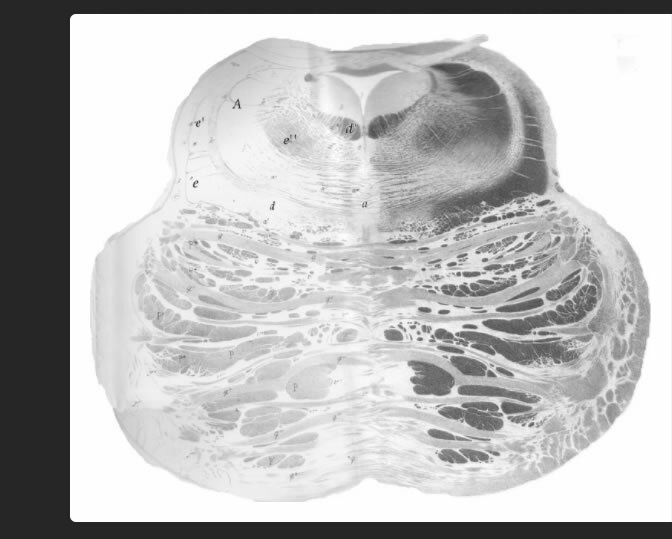 Axial section through brainstem (from Voogd and van Baaren, 2013). 'a" marks the commisure Coronal drawing of brainstem (from Voogd and van Baaren, 2013). 'a" marks the commissure, viewing the dorsum, after removal of cerebellum. This is also from Voogd and van Baaren. "B" is the commissure "b" is one fascicle of the crus cerebelli. In this syndrome, there may be palatal myoclonus, INO, or paresis of the superior rectus and inferior oblique (causing impaired upgaze). Palatal myoclonus is not directly due to this commissure, but rather is due to interruption of a pathway ventromedial to the brachium conjunctivum, so this is probably just collateral damage. This case was of a man who experienced a bleed into his dorsal midbrain and upper pons. Initially he had paralysis of upgaze, convergence retraction nystagmus, and fixed mid-position pupils. On examination 2 years later, he had paralysis of upward gaze, fixed midposition pupils, and a profound dysarthria (called pseudobulbar palsy) including very abnormal prosody of voice, and overshooting saccades to the right. There was clearly no palatal myoclonus. According to Kim et al(2014), Dysarthria is a hallmark of lesions in this area, but it would be difficult to be sure given the rarity of this syndrome. Perez and Nunez (2008) reported a somewhat similar presentation of a patient with a midbrain bleed, but with the blood somewhat more anterior and superior to that found in our case. They again suggested that the dysarthria was due to a lesion of the decussation of the SCP. Kim, T. W., et al. (2014). "Wernekink commissure syndrome secondary to ischemic stroke: severe dysarthria is one of the main characteristics of this syndrome." Neurol Sci 35(9): 1475-1477. (Comment: note mispelling of Wernekinck). Perez, F. J. and C. T. Nunez (2008). "Scanning dysarthria secondary to spontaneous midbrain hemorrhage: case report and review of literature." Eur Neurol 60(2): 89-91.